Friday September 16 1910 It was raining so Will could not go after Lizzie Duncan till after dinner I was busy with the work all forenoon. We spent the last of the afternoon and evening visiting with Lizzie Saturday September 17 1010 Was busy all forenoon. After dinner. Will took us girls down home in the buggy. Sister Ida and Aunt [Eunice? Emma?] were there. It was late when we got supper over and the work done. 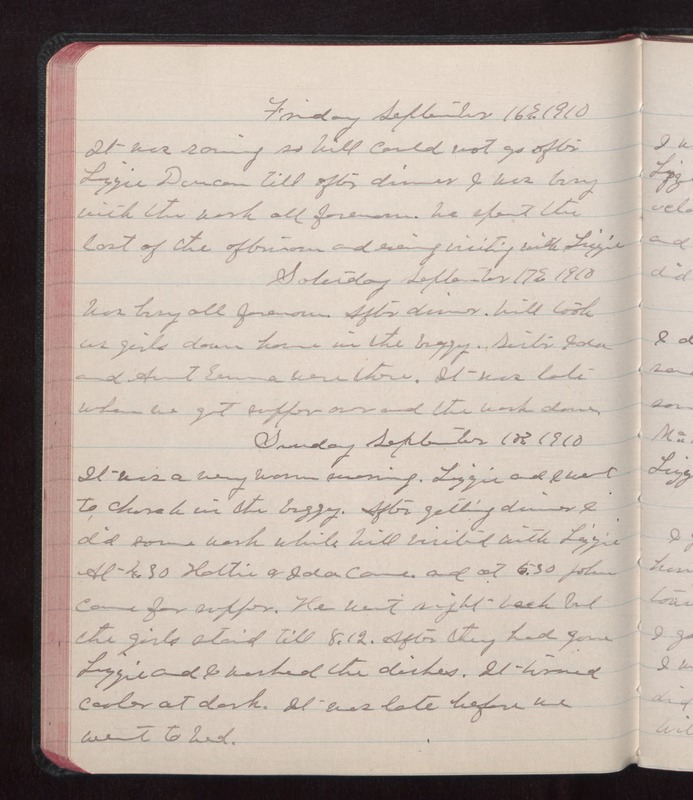 Sunday September 18 1910 It was a very warm morning. Lizzie and I went to church in the buggy. After getting dinner I did some work while Will visited with Lizzie at 4.30 Hattie & Ida came. and at 5.30 John came for supper. He went right back but the girls staid till 8.12. After they had gone Lizzie and I washed the dishes. It turned cooler at dark. It was late before we went to bed.